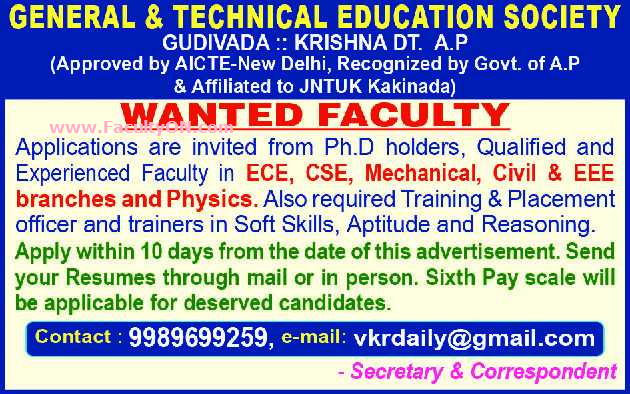 General & Technical Education Society, Krishna has advertised in THE HINDU newspaper for recruitment of Teaching Faculty jobs vacancies. Interested and eligible job aspirants are requested to apply within 10 days from 01st August 2018. Check out further more details below. College Profile: Siddhartha Academy of General & Technical Education, better known as Siddhartha Academy, came into being in the year 1975 with a Corpus Fund of Rs.25 lakhs (Rs.2.5 million) through the efforts of 250 Life members drawn from different walks of life having a philanthropic bent of mind. This was registered as a Society under the Societies Registration Act in the same year. The main objective of the Academy is to establish and run educational institutions offering education at all levels in the fields of general, technical & professional education. How to Apply: Interested and eligible candidates are requested to send bio-data along with copies of certificates / testimonials and recent passport size photos to the college address in person or through email address provided below.